– The watchmaker behind the first watches worn on the moon has designed a new timepiece to mark the 50 years since its first watches flew in space. Swiss luxury watch manufacturer Omega announced the Speedmaster "First Omega in Space" numbered edition chronograph, a near replica of the watch worn by Mercury astronaut Wally Schirra on his 1962 spaceflight. Schirra's Mercury-Atlas 8 mission was the third time an American orbited the Earth and the fifth U.S. manned spaceflight. Schirra, who passed away in 2007, was the first astronaut to wear an Omega watch in space, more than two years before NASA adopted the Speedmaster as its approved timepiece. Since then, astronauts – including the dozen Apollo moonwalkers – and cosmonauts have worn Omega watches on their missions. "This classic Speedmaster is a fitting way to celebrate the beginning of an adventure that would ultimately lead to six lunar landings and half a century of space exploration," Omega said in a statement announcing the "First Omega in Space" edition. In the fall of 1962, a group of astronauts, including Schirra and Gordon Cooper, went out watch shopping in Houston, Texas and bought Omega Speedmasters to wear on their Mercury flights. The manual-winding watches, which were then marketed for sports and racing, were the astronauts' personal purchases, chosen solely by them. On Oct. 3, 1962, Schirra launched on Sigma 7 wearing the Omega Speedmaster he had bought. It performed well but served only as a backup to the on-board timer. It wasn't until two and a half years later, after the Mercury program was over, that the astronauts approached their management and asked for a watch to use during training and flight. 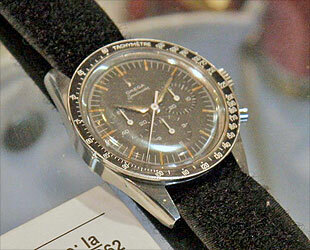 In response, NASA sought samples for testing, including watches from Rolex, Longines and Omega. The trials were designed to literally test the timepieces to destruction. The different brand models were subjected to temperatures topping 200 degrees Fahrenheit followed by being frozen. The watches were then put through shocks 40 times the normal force of gravity, exposed to high and low pressures, high humidity and a highly corrosive 100 percent oxygen environment. They were exposed to high decibel noise and vibrated at up to nine times the force of gravity. In the end, only one of the models survived: the Omega Speedmaster. After each test, the watch would settle to an average rate within NASA's specifications for use. 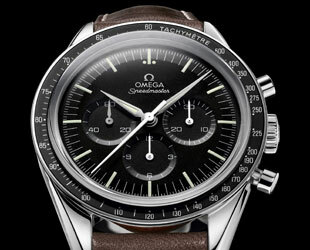 As a result, NASA declared the Omega Speedmaster as "flight qualified for all manned space missions" on March 1, 1965. Just three weeks later, the Speedmaster made its first official flight strapped to Virgil "Gus" Grissom's and John Young's wrists on the Gemini 3 mission. The NASA-approved Speedmaster was similar in its style and caliber to the watch bought and worn by Schirra, but with a slightly larger bezel (the ring surrounding the watch face) and different style hands. Shortly after being flown aboard Gemini 4, Omega amended the watch's name to become the Speedmaster Professional. "So much has been written about the rigorous testing that led to the Omega Speedmaster's being the only watch qualified for every manned NASA mission that it is easy to forget that the very first Omega worn in space was the Speedmaster that astronaut Wally Schirra wore during his Mercury-Atlas 8 mission," Omega wrote on its website. The Speedmaster "First Omega in Space" edition recalls the watch that Schirra first bought at a Houston jeweler 50 years ago. 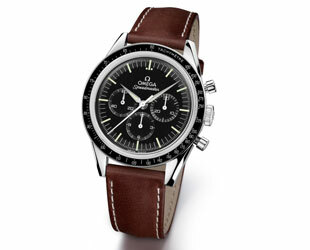 The 2012 model features a black aluminum bezel ring that is smaller than the modern Speedmaster Professional, "Alpha" hands similar in style to the original, and is presented on a brown leather strap. The commemorative edition trades the NASA-approved Hesalite plexiglass crystal for a scratch-resistant sapphire but faithfully reproduces the classic varnished black dial and three sub-dials on the face below. The stainless steel caseback is embossed with Omega's original seahorse insignia and is inscribed "First Omega in Space" and "October 3, 1962," the date of Schirra's flight. 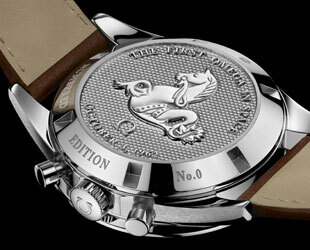 As a serialized edition, the number is also etched on the caseback.